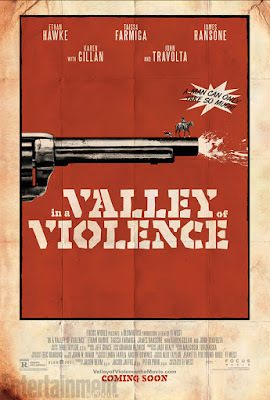 In a Valley of Violence, from director Ti West, has just dropped its official poster online via Entertainment Weekly. Produced by Blumhouse and set for release this fall, the film stars Hawke as a mysterious drifter who ventures into a near-abandoned mining town to exact his revenge upon the perpetrators of an unspeakable act. The cast includes Ethan Hawke, John Travolta, Karen Gillan, Taissa Farmiga, James Ransone, Toby Huss, Burn Gorman and indie-horror director Larry Fessenden. In a Valley of Violence world premiere is on March 12 at SXSW.